Amy Poehler and Nick Offerman are co-hosts of a new show called "Making It." Makers from around the country tackle projects using their own preferred medium. Because it's a competition, the least successful is eliminated each week. I adore this show and not just because it highlights the maker movement in a wonderfully creative way, or that it's hosted by two of the funniest people on TV. Participants have a limited amount of time to create their projects, but there is no way they don't know ahead of time what some of the projects are. They have to have time to figure out their materials and notify the show so each participant has access to sufficient amounts of the requisite materials. My point is that while they may make it look as though they are designing on the fly, the reality is that they have given some thought to what they are doing and how. Enter design thinking in a very real way. First, I'm just going to say this: what we're calling "making" shouldn't be, needn't be limited to a particular place and time and it doesn't always require duct tape or a glue gun. Sometimes the process of making might require only a pencil and paper. I know, right? How droll. Making promotes creativity and engages students in problems of their own invention. Making helps students develop identities as designers, creators, and tinkerers. Through making, students gain access to sophisticated tools for building and thinking critically. Hang on to that. Now let's review what we're talking about with design thinking. A.J. 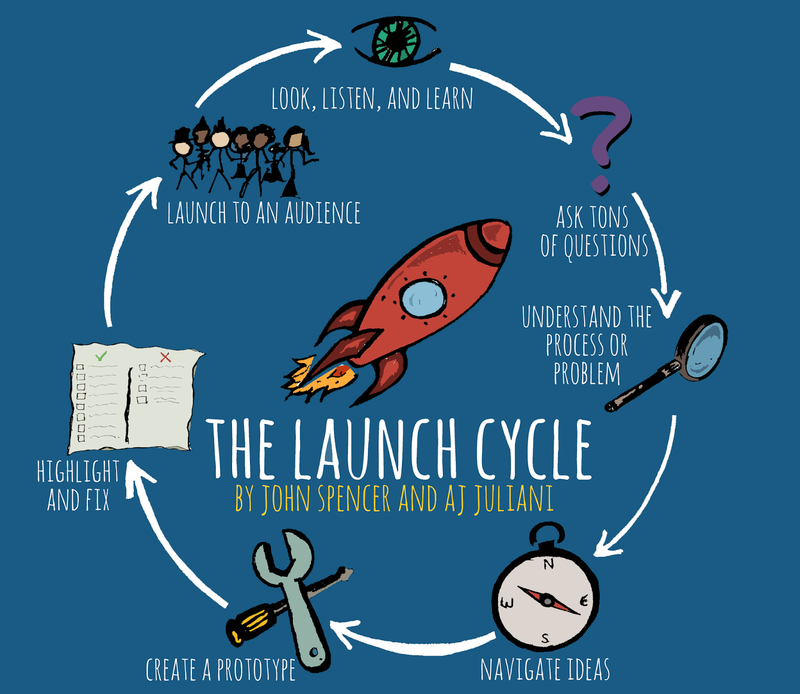 Juliani and John Spencer developed the LAUNCH cycle as a way for teachers and students to navigate design thinking. It's a great structure and you should most definitely visit their website for loads of resources. But I have to say this: all of the projects you see at this site and at many others are about engineering, about constructing something, about science or math. Nothing wrong with STEM or STEAM. I'm a believer. I'm a STEAMer myself. However, limiting design thinking to STEM/STEAM projects is, well, limiting. 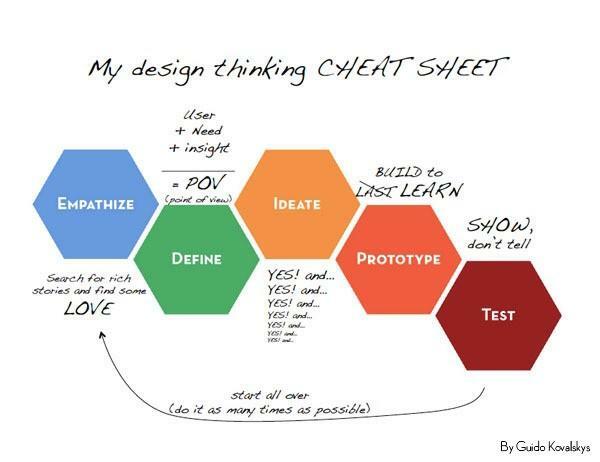 Let's back up to the components of design thinking: empathize, define, ideate, prototype, test. I talk about design thinking and how I used it as a computer engineer/systems analyst in this post, "Design thinking is not an output only process." Or, to simplify: identify the problem and figure out the POV, think about the end user (or reader), brainstorm possibilities, pick an angle and design an approach, design a prototype (write or create that draft), and redesign (revise that draft). How does that work for any content area? First, you have to start with the right question, which may not be an actual question. I'm not going to talk about the "right question" strategy in this post but will in another. I'll make the connections for you, I promise. The not-question might actually be a concept or a broad area of reference or, my favorite, an "I wonder. . . " statement. Why not a question? Because students infer you want a specific answer if you ask a specific question. And they get frustrated if the question is too general. Eons ago I did a high school paper on the religious and political implications of nursery rhymes. I did that paper because I'd heard someone mention that "Little Robin Red Breast" had religious and political implications about a particular Cardinal of the Church and I found that fascinating. That was an "I wonder. . . " moment and I had a fabulous time doing that research. Let's think about social studies. The Treaty of Versailles was signed by Germany and the Allies in January 1919 at the end of World War I. The United States, Great Britain, France, and Italy negotiated the treaty. However, in November 1919, the United States rejected the Treaty of Versailles and refused to join the League of Nations. Rather than give a specific assignment or ask a specific question, I might offer up some "I wonder" statements to give students some idea of possibilities and then let them go from there. For example, I wonder what it felt like to be one of the allied countries negotiating that treaty. I wonder how one of the negotiators might explain what was going on to people back home, politicians or family. I'd also leave the "what" wide open so maybe students would write a series of letters from the POV of one of the negotiators. Or maybe do a series of news bulletins or broadcasts. Design thinking might not work for every lesson or every assignment, but once students get in the habit of thinking in terms of empathize, ideate, design, prototype, and test, they will use those strategies whenever they can. As a former English teacher, I get that you don't always want to read papers and not just because students don't always want to write them. Yes, they need the writing practice, which is one of the reasons we make them write papers, but there are other ways for them to convey that information. 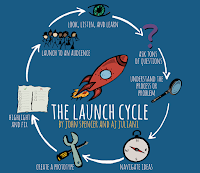 Even if they do a green screen presentation or use Adobe Spark or Book Creator or maybe even assessment tools like Nearpod, Quizlet, or Quizizz to present their content, they could easily use design thinking. And how much more interesting for them and for you if you ask them to write for a different audience. You could let them choose or you can use something like Wheel Decide to randomize options; that could be FUN. Let's go back to that making definition, specifically this part: "Making promotes creativity and engages students in problems of their own invention. Making helps students develop identities as designers, creators, and tinkerers. Through making, students gain access to sophisticated tools for building and thinking critically." Think about tools your students use or could use. Even if they're creating a rough sketch or draft using pencil and paper, isn't that a form of tinkering? If they're working with classmates and they're pointing and grabbing at the pencil and erasing and talking over each other to adjust lines or numbers or ideas, isn't that tinkering? isn't that making? And while they're working alone or with each other working on that draft, whether using pencil and paper or a computer, they are thinking about the end user, they are thinking about the best approach, they are thinking about what will work and what won't: they are, probably almost by default, using elements of design thinking. The more we encourage students to use design thinking, formally and informally, the more likely we are to help them tap into their skills and "identities as designers, creators, and tinkerers." Having said that, however, let me strongly encourage you NOT to formalize design thinking or laminate the steps as an anchor chart. There are ways to encourage this way of thinking without making it too formal. Years ago, when I was still teaching literature as a general education class, I decided I could not read one more 20+ page research paper written under duress. I thought about why we were asking for such papers and I knew it was a culminating project to demonstrate learning. Okay, so why torture the students and me? So, way before all of this stuff was cool and trendy, out of sheer exhaustion and in self-defense, I told students they could do a final project however they wanted and for whomever they wanted as long as the audience wasn't me. They could create a video, design a game, create a sculpture or a painting, etc. Whatever as long as it expressed something about something in the class. And, of course, they could write a paper if that's what they wanted to do. I asked for an abstract so they could tell me what they were doing, explain the intended audience, and how it connected to the course which enabled me to create a simple rubric. I told them they were NOT being graded on the level of craftiness but on how well that product connected to what they wanted to say about what they learned in the class. I got some amazing work. They were designers, creators, and tinkerers and I got student work that enabled them to express themselves in ways that truly reflected themselves as learners. Younger students might need more guidance and help with resources, but don't underestimate what wonderful creative thinkers and designers they can be when given the opportunity.